Regimental Chapel of the P.W.O.R. ​​​​The Rev. Robert Cartwright, a popular Assistant Priest at St. George’s and Chaplain to the forces in the Kingston Garrison, died after 13 years at St. George’s. ​After his death, the citizens and troops decided to erect a church in his memory. St. Paul’s was built by the Royal Engineers in the middle of the Lower Burial Ground cemetery, and paid for by public subscription. The foundation stone was laid on Easter Monday, April 13, 1845 by the Hon. John Macaulay. The church opened for worship on St. Paul’s Day 1847. Due to the generosity of the congregation at St. George’s, the church was debt-free by 1849. St. Paul’s was more or less a Garrison church in the early days, as many of the troops of the Garrison used to attend Sunday afternoon services arranged by the Chaplain to the forces, the Rev. J. Bartlett. St. Paul’s connection to the military continues to this day, as it is the Regimental Chapel to the Princess of Wales’ Own Regiment. In 1854, sparks from a fire at the Chekers Hotel (at Princess and Bagot) set fire to the wood shingle roof and caused considerable damage, but left the walls intact. It is said that the rector, Rev. William Grieg, contracted an illness from exposure to the elements, in his zeal to try and save his church during the fire, and died the following year. 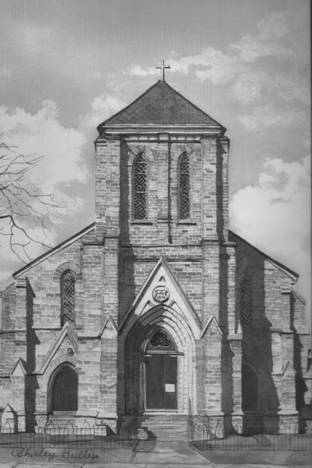 The church, widened and with a new Chancel, re-opened in August 1856 with further restorals. ​The Sanctuary window was given in memory of the Rev. William Grieg, first rector, by the Rev. J. Bartlett, Chaplain to the Garrison, in 1855. ​Light during the early days was by oil lamps. After the fire, gas lighting was installed. Electric lights were installed around 1907. The Parish Hall was built in 1872 as a Sunday School. It was not until 1933 that the Parish Hall was modernized and indoor plumbing was installed, after which the Sunday School children no longer had to use an Outhouse located in the churchyard. The Parish Hall was enlarged in 1956 and joined to the church in the 1960s, providing much needed kitchen facilities and office space. Up to the year 1928, St. Paul’s never had a rectory as its own property, but by request and advice of the Lord Bishop of the Diocese, a rectory was purchased by the church in 1928 at 241 Queen St., an old stone house. The Queen St. house was eventually sold and another house on Victoria St. was purchased. This house was sold in the late 1960’s and since then St. Paul’s has had no rectory. ​Major restoration of the buildings has been going on since 1992 when the tower and front façade were restored. Since then the foundations have been stabilized, the roof shingled and the Parish Hall and church walls repainted (except the east wall). Offices were built above the Parish Hall, and a Nursery, and Music Room were built under the balcony. The first European settlers at what is now Kingston were the French who came in 1673. The British captured the French fort in 1758 and removed the inhabitants. But, the British left too and did not return until 1783. In that year survey parties came to prepare for the arrival of the Loyalists who were looking for a place to live under British rule after the American Revolution. The survey included land set aside for a cemetery which became known as the Lower Burial Ground. ​It was the first Protestant burial ground in Kingston, and one of the oldest consecrated cemeteries in Ontario. As expected, Loyalists, who wanted to continue living under British rule, came to Kingston after the American Revolution. A Loyalist soldier, Corporal Forbes of the King’s Royal Regiment of New York (Royal Greens), was the first to be buried here in 1783. There were about 600 more burials over the next 80 years, many of which were in unmarked graves. This is the resting place of most of Kingston’s original settlers. The bodies of some aboriginals, slaves, soldiers, and sailors also lie here. As well, many of the founding fathers and mothers of Kingston are buried here. ​The Rev. John Stuart, the founding rector of St. George’s, consecrated this burial ground in 1784. He was also a missionary to the Mohawks and founded the Anglican Church in Upper Canada. Rev. Stuart and his son, the second rector at St. George’s, Archdeacon George Okill Stuart, are buried along with eight other family members in a walled “Lair.” The Stuart “Lair” is a stone enclosure built in the 1840s that includes family burials from 1811 to 1862. ​Tekonwatonti (Molly Brant) (c 1736 (in Ohio)-1796), the influential matriarch of the Mohawks was also interred in this burial ground. She was the consort of Sir William Johnson and bore eight children by him. She and her brother Thayendanaga (Joseph Brant) influenced Mohawks and most other Iroquois to remain loyal to the Crown during the American revolution. Molly came to Kingston in 1783. The British government built her a stone house and paid her a pension. Molly and her family were also given land in what is now Cataraqui. She was the only woman among the founding members of St. George’s Church. Her burial location is unmarked, but there is a plaque in her honour on the right side of the church entrance. Sir William Johnson (c 1715-1774) was the Superintendent of Indian Affairs for Britain’s northern colonies. ​Joseph Forsyth (c 1760 (in Scotland)-1813) was a victualler for the army, brewery owner, land speculator, forwarder, retailer, justice of the peace, road commissioner, collector of customs and a warden at St. George’s Church. The Forsyth “Monument,” erected in 1813, is a stone shelter for a plaque. When the church was built it was put very close to the east side of the monument. Family names that mark other burial plots include Cartwright, Macaulay, Smith, Deacon, Murney, Metcalf, Hagerman, Hall, and Bonnycastle. Although it was an Anglican cemetery, for many years the Lower Burial Ground was the only Protestant one in Kingston. People of other denominations were buried here but always with Anglican clergy officiating. This created friction, especially between the Rev. John Barclay of St. Andrew’s Presbyterian Church and the Rev. George Okill Stuart of St. George’s Anglican Church. The dispute ended in 1825 when the military cemetery, called the Upper Burial Ground (now McBurney Park), was expanded to make room for the Presbyterians. St. Paul’s Church (built 1845-47), the Parish Hall (built 1872) and the east parking lot were later put on top of the Lower Burial Ground. Today, all that can be seen is the portion between the church and the wall along Montreal St.
​The cemetery used to be surrounded on three sides by stone walls that were built in 1799-1808. At first, the walls were dry stone but mortar was added later. The walls were rebuilt and modified over the years and now only the Montreal St. portion remains. ​As the Cataraqui Cemetery was opened for burials in 1850, the churchyard at St. Paul’s was no longer used. The last burial was that of Jane Miller in 1863. A plaque located at the Montreal St. entrance provides information about the Lower Burial Ground and a list of memorials.